In many ways also, Mies van der Rohe was able to realize spatial and structural ideals that were impossible in larger projects, such as the Seagram Building. For example, the I-beams of the Farnsworth House are both structural and expressive, whereas in the Seagram Building they are attached to exterior as symbols for what is necessarily invisible behind fireproof cladding. In addition, the one-story Farnsworth house with its isolated site allowed a degree of transparency and simplicity impossible in the larger, more urban projects. First conceived in 1945 as a country retreat for the client, Dr. Edith Farnsworth, the house as finally built appears as a structure of Platonic perfection against a complementary ground of informal landscape. This landscape is an integral aspect of Mies van der Rohe’s aesthetic conception. The house faces the Fox River just to the south and is raised 5 feet 3 inches above the ground, its thin, white I-beam supports contrasting with the darker, sinuous trunks of the surrounding trees. The calm stillness of the man-made object contrasts also with the subtle movements, sounds, and rhythms of water, sky and vegetation. The dominance of a single, geometric form in a pastoral setting, with a complete exclusion of extraneous elements normally associated with habitation, reinforces the architect’s statement about the potential of a building to express “dwelling” in its simplest essence. While the elongated rectangle of the house lies parallel to the course of the Fox River, the perpendicular cross axis, represented by the suspended stairways, faces the river directly. With its emphatically planar floors and roof suspended on the widely-spaced, steel columns, the one-story house appears to float above the ground, infinitely extending the figurative space of the hovering planes into the surrounding site. At the same time, the prismatic composition of the house maintains a sense of boundary and centrality against the vegetative landscape, thus maintaining its temple-like aloofness. The great panes of glass redefine the character of the boundary between shelter and that which is outside. The exterior glazing and the intermittent partitions of the interior work together dialectically, shifting the viewer’s awareness between the thrill of exposure to the raw elements of nature and the comforting stability of architectonic enclosure. The architecture of the house represents the ultimate refinement of Mies van der Rohe’s minimalist expression of structure and space. It is composed of three strong, horizontal steel forms – the terrace, the floor of the house, and the roof – attached to attenuated, steel flange columns. Since its completion in 1951, the Farnsworth house has been meticulously maintained and restored. 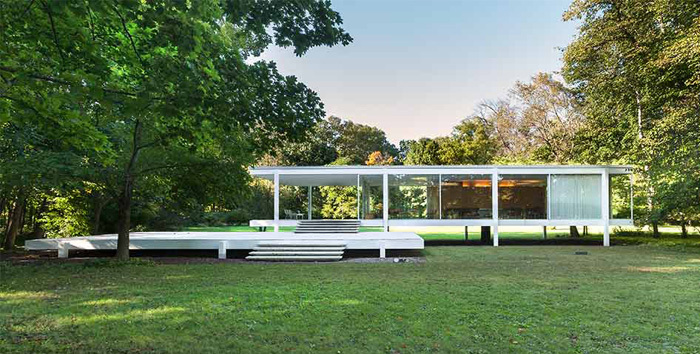 The most important restoration took place in 1972, when then owner Peter Palumbo hired the firm of Mies van der Rohe’s grandson, Dirk Lohan, to restore the house to its original 1951 appearance. 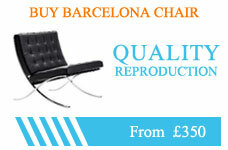 A second restoration took place in 1996, after a devastating flood damaged the interior. Although the house was built to resist floods in 1951, building in the surrounding area has caused higher flood levels in recent decades.